Chemtronics Static Free™ products are engineered to protect electronic equipment and workspaces from static buildup while cleaning and reconditioning. These products provide everything required for a comprehensive surface treatment program as recommended by ANSI/ESD S20.20. This is our tried and true Mat Cleaner (ES1664T) on a lint-free wipe. It removes caked-on flux and other contamination off your ESD-safe mats and adds a little treatment that rejuvenates the dissipative surface. 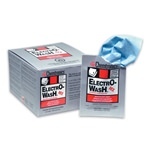 These wipes can bring old ESD-safe mats BACK TO LIFE!